Inspired by Lea Michele’s engagement ring? Read more to learn how you can find a similar style for your big moment, too. No matter how much you love your spouse-to-be, it’s not always realistic to spend tens of thousands of dollars on an engagement ring. Luckily, how much you spend does not correlate with how much you love your significant other, but rather an engagement ring is meant to be a symbol of love, passion and commitment --no matter the price tag. What Is The 5th C of Loose Diamonds? You might have heard a few things about the "four Cs" of loose diamonds. 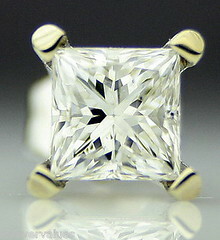 Cut, clarity, color, and carat are all important factors in determining the price and quality of a loose diamond. But, while the four Cs give you a basic understanding of diamonds, they can really oversimplify everything involved with assessing a loose diamond. So what is our definition of the fifth C in the equation? It's certainty. Diamond engagement rings don't always have to have traditional colored diamonds. Engagement rings can also feature other diamond colors, such as pink diamonds and yellow diamonds, that offer something a little different. These accent colors can make for a beautiful piece that is as uniquely colorful as she is. Not all women are meant to have a modern engagement ring. You may find that you girlfriend enjoys vintage style jewelry and would probably want a unique, vintage ring instead of a traditional style engagement ring.